Listening Indicators is a print designed and printed specifically for Detroit's Inaugural Community Supported Art 2012 season. Here, Jessica is seen wearing the Listening Indicators. These earnest ear devices come as a flat fine art print and are able to be cut out and folded up as needed by the print recipient. 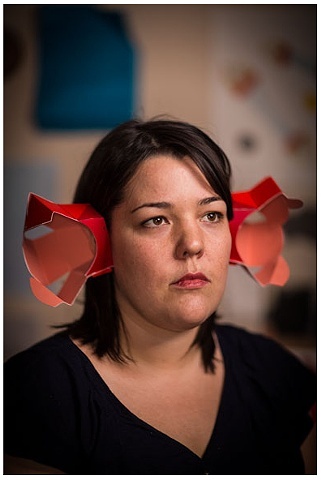 The listening indicators are good at bending one's ears and are very helpful in verbal negotiations where one party is meant to be listening and absorbing all that the other party is saying.